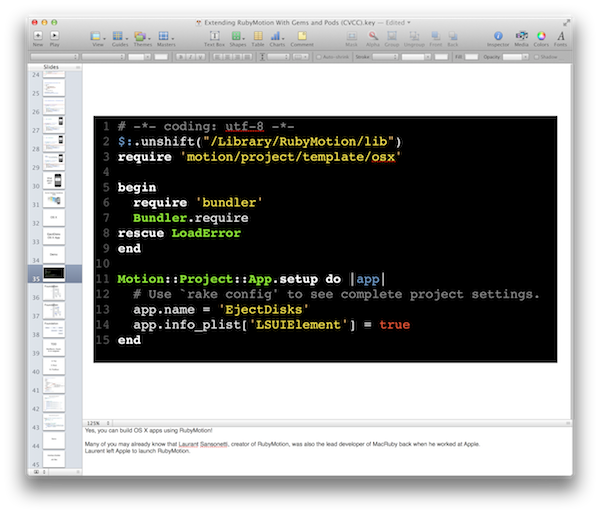 When giving a presentation to a group of developers, you might want to add blocks of code to your slides. It’s helpful to maintain the syntax highlighting while you copy the code. :TOhtml offers a quick way to copy code snippets from Vim to Keynote, while syntax highlighting remains intact. Fire up Vim and drop the block of code you want to convert into a new Vim buffer. 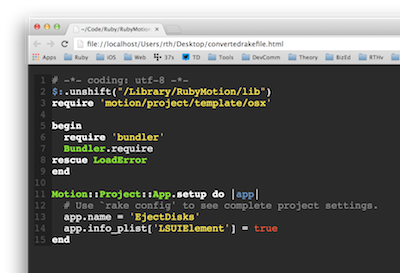 In this example, I’ve created a sample RubyMotion OS X app, and I want to show the contents of the Rakefile. * we corrected the raw number to a line ID. Open the converted file in a web browser. Copy and paste the text from the browser into Keynote. Darken/lighten the background in Keynote by using the Keynote inspector. Here’s what the finished product looks like. All the clarity of syntax-highlighted text. You can even adjust font size at will using the Keynote inspector. All set for the presentation. Can this process be simplified? If you know the answer, feel free to mention it in the comments below. Thanks!